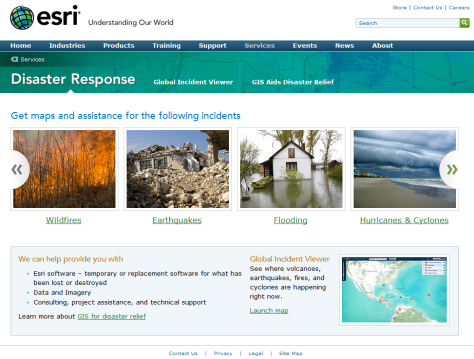 Today I received an email highlighting the assistance Esri is standing by ready to offer for those assisting with disaster response. This email included a link directly to the Esri Disaster Response Webpage. Types of assistance include everything from software to data and even consulting. Most all types of disasters are included, wildfires, earthquakes, flooding, hurricanes and cyclones, spills and volcanic eruptions. All you have to do is ask. Nothing is guaranteed, but if you have a need, you never know unless you ask!